The Palm TX is Palm's new wireless handheld. It features a improved 320 x 480 pixel screen, Wi-Fi and Bluetooth wireless and 128MB of nonvolatile memory. The TX drops the Tungsten sub-brand moniker but adds Wi-Fi at a very competitive price. The TX and Z22 are the first new models to return to the Palm name, after the company reacquired the rights to the Palm name. 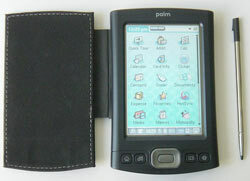 Palm has decided to drop the Tungsten sub brand, in order to highlight the strong Palm name brand. The TX has solid body and finish. It is black plastic, though it is very rigid and almost feels like a metallic shell. The TX is physically identical to its predecessor the Tungsten T5 besides the new black color. It has the exact same dimensions and body. Overall the TX has a very simple and smooth design reminiscent of the Palm V. The rectangular display makes up the majority of the front of the handheld. A white painted Palm logo is pressed along the top. The sides are smooth and the corners are nicely rounded. The left side functions as an attachment rail for the flip cover and the right rail doubles as a slightly open stylus silo. Two sets of black customizable application buttons border the rounded rectangle 5-way navigator in the center. The buttons are flush with the case and have a sturdy feel. The 5-way is solid and has a smooth finish and is easily to pressed in each direction. 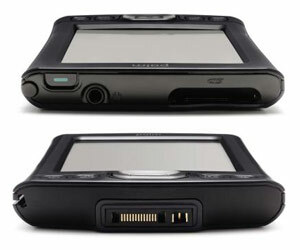 The top of the handheld is made of a glossy black plastic. On the left is the SD expansion slot, which unfortunately lacks a dust cover. To the right is the IR window, the standard 3.5 mm headphone jack and the power button. The bottom is slightly curved to the font and holds the multi connector in the center. The back of the handheld is mostly smooth. The reset button is in the mid center and is now large enough to be pushed with the stylus tip. The speaker is also located on the center of the back, with a 5x5 hole grid. Below that is the standard sticker label with the Palm TX logo and the usual logos and serial numbers. The TX has physical dimensions of 4.76 x 3.08 x .61 inches (120 x 78 x 15.5 mm) and weighs 5.25 ounces (149 g). It is just slightly larger and taller than the Tungsten E2. It is both shorter and thinner than the LifeDrive. The handheld comes with a pleather black flip cover. It has a white stitching border that says "palm" centered on the bottom. It is a little different from the T5 flip cover as it has a more suede like feel. The stylus is polished steel metal and has a nice silver barrel with a black plastic tip. It is the same stylus as the T5 and is fairly comfortable with a good weight and size. The Palm TX is powered by a 312 MHz Intel XScale (PXA270 family) processor and runs Palm OS Garnet v.5.4.9. It has 128 MB of nonvolatile memory, of which 100 MB is user accessible. It has both Bluetooth (v1.1) and Wi-Fi (802.11b) wireless technology. It also has a SD expansion slot for SD, SDIO and MMC memory cards. The TX has a 16bit color, 480x320 pixel transflective TFT screen, which measures 3.25" x 2.2" inches. It is the same improved display that the LifeDrive is equipped with. The display is 30% brighter and has 40% better color saturation than previous models. The screen is very vibrant and holds up extremely well both outdoors and in direct sunlight. There is an on-screen slider to adjust, but it does not turn off the backlight. The display supports both portrait and wide-screen landscape orientations and switches with a touch of the icon on the status bar. 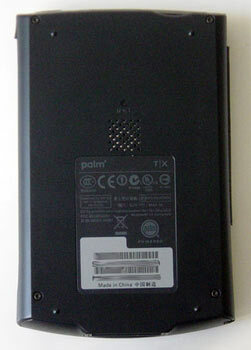 The Palm TX uses a 312 MHz Intel XScale processor. While not the fastest chip on the market the TX performs very well and the lower clock speed helps increase battery life. Listening to an mp3 and browsing the web over Wi-Fi was no problem and every game I threw at it ran very smoothly. Benchmark v3.0 rates the performance at 515%. 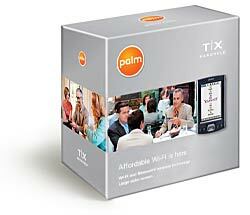 The Palm TX has both Bluetooth v1.1 and a WiFi (802.11b) wireless radio's built in. The TX is one of the most affordable PDA's on the market with integrated dual wireless. Both radios can be used concurrently. Wi-Fi is controlled by a signal strength indicator on the status bar. Setting up a network connection is a fast and easy. There is a network scanner that shows all networks in range. If the network is open all you need to do is tap connect and wait 2 seconds to establish a link. The Wi-Fi signal range on the TX is quite good. It supports both WEP and WPA wireless security. Bluetooth can keep you connected on the road via a compatible mobile phone if you can't find a nearby WiFi hotspot for internet access. With Bluetooth, you can dial out contacts from your address book, send and receive files and applications wirelessly, send sms and photos from your phone, link up to a Bluetooth GPS, hotsync wirelessly, and connect to the internet from a bluetooth mobile phone, computer or a bluetooth access point. 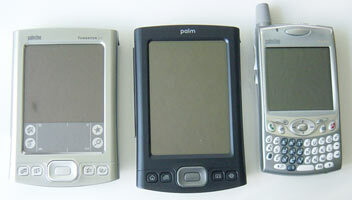 Palm includes setup wizards that make connecting to a bluetooth phone and dial-up network connection very easy. 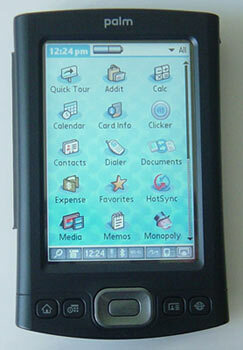 The Palm TX has 128 MB of nonvolatile flash memory, of which 100 MB is available. This is a pretty ample amount of internal space, given its price point. There is no usb drive mode, as seen on the T5 and LifeDrive. Because the unit uses nonvolatile flash memory, it will always preserve its data even when the battery completely runs out. TCPMP reports the dynamic heap as 4 megabytes. The TX has a rear mounted mono speaker. The speaker is adequate for games and alarms. You can also play mp3's though the speaker but headphones (not included) will provide a much better experience. It has a standard 3.5 mm stereo headphone jack. Unfortunately, the T5 does not include vibration support or and LED for silent alarms and does not have a microphone. I was disappointed to discover the TX still uses the same old fashioned pilot 1000 alarm sounds for the calendar. The TX has the now standard Palm multi-connector for hotsyncing and recharging. The TX hotsync runs at usb 1.1 speeds. Unfortunately, the TX does not ship with a cradle. Instead it comes with a USB cable and a separate AC charger, that can plug directly into the handheld or into the dual USB cable connector. The USB cable alone will not charge the handheld from the computer, you must attach the AC cord. The supplied USB cable has a button on the connector that can be used to initiate a hotsync. The TX has a non-removable 1250 mAh lithium ion rechargeable battery. Palm states the TX will have a 5 day battery life with normal usage. Normal usage according to Palm would be approximately 40 minutes/day (20 mins of Wi-Fi, 20 mins of non wireless use such as PIMs, Photos and Docs). 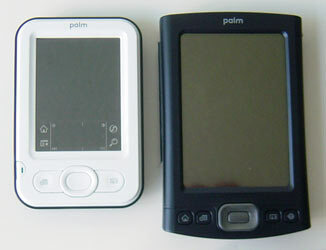 The Palm TX can play continuous mp3 audio for about six and a half hours. I was able to average around 5 and half hours of various use per charge while using wireless a couple times a day. If you plan on using the Wi-Fi often, you will definitely have a shorter life span. Of course the Palm TX includes Palm's excellent enhanced PIM applications. The PIM apps more closely resemble Microsoft Outlook for better compatibility. Calendar features an agenda view that lists your upcoming schedule, tasks that are due and shows the status of your VersaMail inbox. 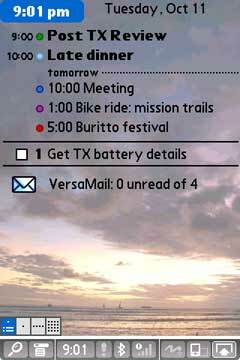 You can also select a background image for the agenda view. You can also set a background image in the launcher and favorites application. You can assign colors to different categories, add appointment location details and a there is year calendar view. Palm also made it possible to have events spanning midnight, separate calendar support and the ability to beam multiple appointments and categories. Contacts has all the latest enhancements including contact photo support. You can have multiple contact addresses, such as work, home, other. The are more fields for additional phone numbers, email addresses, website and instant messaging accounts. There are a total of nine custom fields and a birthday field, which will keep track and remind you before someone's approaching birthday. Palm bundles the latest v7.006 release of Dataviz's Documents to Go in the device ROM. Docs to Go supports creating and editing native Microsoft Word, Excel and Powerpoint documents. You can access files received from email attachments, Bluetooth, stored on SD or beamed to the device. It also includes DocSync to sync with documents on a Mac or PC. Dataviz is currently working on support for native Adobe pdf files and expects to release it later this fall. 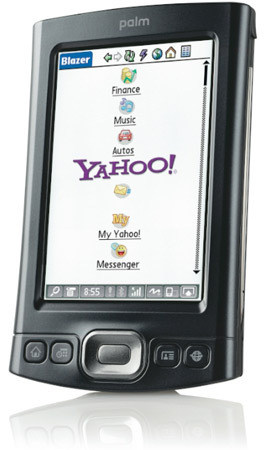 The TX includes Palm's media application for viewing photos and videos. 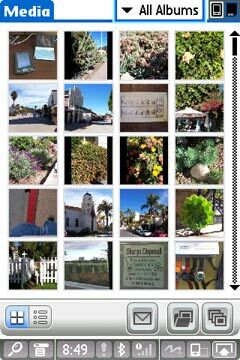 The media application has been greatly speed up to display photo thumbnails, even from large megapixel digital cameras. You can manage and create photo albums on the device or an expansion card. The program can also display slide shows with a number of different animated transitions. The video player has been updated with full screen mode, but still does not support many video codec's such as Divx. Fortunately there is a more than excellent free media player available, TCPMP to pick up the slack. Palm includes Pocket-Tunes v3.09 for digital audio. This is a much nicer player than RealPlayer and offers support for background play, on device playlists and skins. It supports MP3, WAV and Ogg Vorbis files. Unfortunately this version does not support WMA files or the windows based music stores. VersaMail v3.1 is the included email client. It supports both POP and IMAP email servers, users can download mail wirelessly or by synchronizing with their desktops. For Enterprise users whose companies run Microsoft Exchange Server 2003, VersaMail has built in Microsoft Exchange Server ActiveSync that will directly import and enable corporate email and calendar synchronization. The Palm TX incorporates the one handed navigation system that debuted on the Treo series for a superb one handed user experience. The 5-way navigator and new code make it possible to perform many tasks without using the stylus or needing to tap the screen. There is a light blue glow that highlights dialogs and form elements, that acts much like an on screen cursor. It really makes using the handheld with one hand easy and much more intuitive. It works well within many of the included apps and also works on many existing third party programs. The one-handhed experience has further been improved with the addition of a dedicated Home button that can link back the launcher or the favorites application. Holding down the home button for a few seconds will also bring up a list of your last six apps used. To make room for the Wi-Fi icon on the status bar, Palm removed the home button from the status bar. That omission makes stylus navigation a bit more cumbersome. You are forced to either bring up the input area, or hit the home button with your finger or stylus. It would have made more sense to keep the home icon and move the find option somewhere else, instead of dropping more useful navigation function. Graffiti 2 handwriting recognition is included for data input on the handheld. The dynamic input area can also be used as an onscreen keyboard and you can also write Graffiti anywhere on the screen. For those that prefer classic Graffiti, you can install the old libraries to enable Graffiti 1. With all the reported instability of the Tungsten T5 and Treo 650, the TX seems to corrects a lot of issues. I found the TX to be a very stable machine, and it hasn't crashed on me yet. Also gone is the status bar flicker bug from the T5. The TX also has an improved reboot time over the T5. The T5 took a ridiculous 32 seconds to reset, while the TX cuts it in half to 15 seconds. One the desktop side of things, Palm includes their Quick Install program for Windows. Quick Install simplifies installing programs and converting documents and photos for handheld use. Users simply drag zip files, prc application files, photos, videos and even MS office files into the app and it will preform the necessary conversion and install the the files on the next hotsync. The software CD includes the Palm Desktop for windows and Mac as well as the Outlook synchronization conduit. The full list of applications on the device include: Quick Tour, Addit (for news headlines and adding software), Calc (with Advanced mode), Calendar, Card Info, Contacts, Dailer, Documents to Go, Expense, Favorites, HotSync, Media, Memos, Note Pad, pTunes, SMS, Solitare, Tasks, VersaMail, Blazer web browser and World Clock. On the included CD is the Palm Desktop for Windows and Mac OS X, Adobe Acrobat Reader, Audbile player, eReader, a trail of HandMark Express and WiFile for accessing files on a PC over Wi-Fi. The Palm TX is an affordable and desirable handheld at $299. The wait is over for an reasonably priced handheld with Wi-Fi in a compact form factor. The TX combines a incredible amount of features an capabilities at an outstanding debut price. The Palm TX is available now from the Palm online store and at Palm Retail Stores and at select retail and resellers throughout the world. Anyways, lets see how much they get working right away-I am pretty pessimistic after the tenth exchange for my T3! Nice review, Ryan. How long have you had to play with this baby? File this away under the category "Too little, too late". 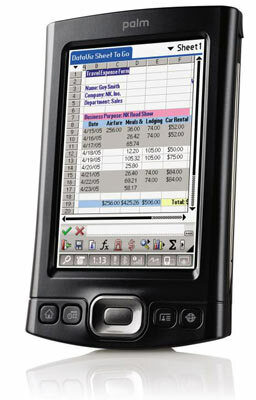 These are the kind of specs that should have been released by Palm in... 2003. Ryan, I hope you plan to come back and do an addendum to this "review" after you've had time to thoroughly evaluate it. It seems that in the rush to "review" PDAs the day they are released, most sites have sacrificed the kind of detail that purchasers need to make informed decisions. Most times that updated reviews are promised, they never seem to materialize. The buzzing is really a product of the display, not of the OS or hardware. My T|X is perfectly silent. Others may buzz, depending on what screens they have. Nor is the problem limited to Palm OS, I used to have an Axim X3i that screamed like a banshee, but my other Axims are quiet. > "...File this away under the category 'Too little, too late'..."
If by "this" you mean your post, actually it will be filed under "Voice-of-Dumbness is spreading FUD, ignore as usual". just curious...is it VERY much complicated and expensive for Palm to add a cell phone capability to a lovely device like this? for me, i would much rather have EDGE/GPRS on this than WiFi. Because that way I can throw away my mobile phone, and use T/X for full internet/email/chat ANYWHERE i go, always carrying one with me, not having to look for WiFi Zones. warpSpeed completely eliminated the extremely loud whine coming out of my T2. Recently I also replace the digitizer on the same T2 and had the noise reduced by over 90% without warpSpeed activated (i.e. I have to have it close to my ear in a quite room to hear any noise). And I completely agree with the original post subject: Sweet!! I'm looking forward to getting one next month when it is released here with the bundled Chinese OS. That, would be a Treo. Now I'm really tempted to get one of these at $299. I've got a 650, but would love to have that to surf the web on at home or read before going to bed. If Palm produces something worthwhile I'll be back to Palm but I don't see anything worthwhile on the horizon, this T/X isn't the dog's knackers that the Exec is. "The buzzing is really a product of the display, not of the OS or hardware." The display is part of the hardware. Duh. Unles Palm supports all of the new profiles etc of BT 1.2 (and wouldn't Ryan have mentioned it if they did?) then what would be the point of it? Isn't the .1 Bluetooth upgrade something that can be done via software, if executed properly? This is a nice machine but still too late. Dropping the price down to $250ish makes it MUCH more palatable, however. Dropping it to $50 makes it wildly popular! At $299 Palm has actually woken from a slumber. This is a very strong hardware set at that price and I pinch myself to make sure I'm awake in saying it. This will compete veeeery strongly with anything from Dell or HP at around $300. I'm actually impressed. I expected Palm to pull a $399 stunt with a free ferrit or something. This is the first thing to loosen up my fingers a bit from my T3. It looks gorgeous, and it's very attractive. I'll miss the USB drive mode, but that's a minor details. I don't think soo... First of all, in 2003, there is no way the Tx could have been priced at sub $300 price point!!! That is the most attractive feature of the device. Heck, none of the main competitors of the Tx in the market place TODAY (i.e, the iPAQ rx1950 and lowest end Axim x51) include features like wifi and HVGA screen. So if the PPC competition does not even offer comparable features at this price point NOW, how can Palm possibly be late to the party? Someone (MacMall?) is already selling the TX for $279.99 or so. By Christmas I am sure we'll be able to pick this thing up nearly everywhere online for that price or even a bit above $250. Rememeber the famous Office Depot $100 PDA mail-in rebate? Imagine that one coming around again later this year and mated to a TX? $250-$10 OD in-store coupon-$50 MIR---$140 & change net cost! way too little too late I have a t3 515 and a 500 I've been waiting for wifi and more memory I also have tomtom navigator and wireless keyboard several cables and 3 cradles. I wanted to upgrade but palm has changed the universal plug so nothing will work with all my stuff. The battery will not hold a charge so I bought a new one (third party because palm just dosesnt care enough)it holds a charge for an hour and a half. I think the t5 was a joke that was made for new palm market entrys and now its too late. I have decided to fore go my hundreds of dollars of software and accessories and I'm going with axim x51v. Anybody interested in the stuff i mentioned above plus ptunes office to go 7 aol sheets to go palmreader pro and a lot more let me know. not to mention the t3 itself although i may give that to my daughter. Who said anything about price? You did, simply to obfuscate. The TX is late because the competition (several Windows Mobile/PPC models and the CLIE TH55 + UX50) has had dual wireless for several YEARS already. VGA screens have been around for a while as well. The fact that - on the surface - the TX appears to offer a lot for its price point doesn't change the fact that Palm is very late in offering this combination of features in a SINGLE device. Try not to Kirvinize like you frequently do, Bubba. I think it's time Ryan put the smack down on a PIC mod (or two) as well as the good Dr.
Say what you will, TVOR's attacks are (USUALLY) tongue in cheek and ALWAYS backed by well-written wit and well-founded arguments/cases/opinions about the mobile computing industry. Those that retaliate to said commentary usually end up throwing the same kind of tantrum they claim to be railing against. There's a difference between tongue-in-cheek J.C. Dvorakisms (if you don't know, don't ask) and outright name-calling. Still running strong. Battery life hangs in there pretty well w/ low brightness (dimmest level) and BT on. D-pad is a definite improvement over the T5/T|E clones. Wi-fi really drags it down, even faster than on the LD IIRC. Case resists fingerprints remarkably well. Screen is "rougher" than previous Palms I've used. Good feedback with & without a screen protector on. Not a good use for a ship. Perhaps from past experiences with e-t we could enhance these thoughts too. Perhaps in the near future we will have the choice to assure ones thoughts are not misused by offering the choice to interact with IT (internet technology) that efficiently and from any PC on the globe offers accountability to ones thoughts securely. This will aid with the assumption issue vs facts not obtained from the individual and in some cases paid for without any sharing of the wealth with the group that owen their thoughts. Not too accurate when the information has not been veted by the originator(s) of the thoughts. Just some thoughts to save time and money at a later date. I really don't understand this at all. So I can post whatever trash I want to if somehow it can be perceived to be "tongue in cheek"? Give me a break. The trash is still trash no matter how many gallons of perfume you think were thrown on it. I would ask Ryan to hold everyone to exactly the same standard no matter who they are or what they do for a living/hobby. Just because TVOR is an anonymous poster with a bit of wit and some thoughtful insight shouldn't give him any more leeway when it comes to "moderation" (censorship) than the Palmsource employee or a PIC moderator. How about simply being even-handed? The only difference I can see is simply one of history. TVOR has a boatload of it. How many times has he violated the posting guidelines? How deep into the "cesspool" has he delved in his attacks? How many times has Ryan had to come in and wipe his "crap" off the front page? hkklife, you appear to be quite one-sided in your quickness to judge here. Please show me some evidence that I am wrong, and I will readily admit as much. Please show me where instead of defending TVOR, you have asked Ryan to censor "him". If someone (I use the term in the plural and directed at no particular individual) bring AS much compelling reading/insider info to the table, then, for better or worse, some people are going to wade through the detritus and enjoy reading the "good stuff". This perfectly sumarizes my feelings on TVOR's wit/insight. Look at it this way--would you rather have a raging Charles Barkley (volatile MVP talent) on your roster or a mild-mannered bench warmer who brings nothing of merit to the table? Yes, I'd appreciate it if he/she spent MUCH less time making jabs at people and spent more time doing the kind of commentary only he/she is capable of (where's that NZ90 vs. LifeDrive comparison, btw?). Even I can only take so many "bubba" jokes per day. That said, Ryan is being asked to do an impossible task (police each and every user/post on PIC) and has to strike a balance between heavy-handed censorship and running a fairly liberal site. If you cannot trust one of your mods to keep the situation under control then who to turn to?? Basically, Gfunk is a mod, first and foremost. Voice isn't a moderator and therefore doesn't need to be held to such a high standard. I have to admit being disappointed seeing Gfunk going off on such a tirade as I had thought him above such silly rampaging. I've never asked Ryan to delete anyone's comments--good, bad, or otherwise. And, E-T, you are truly amazing. ET's post was about the quickest smothering of a flame-post war I've ever seen on this or any other site. It was quite...ambiguously timely. Thanks, hkklife. It's nice to see there's at least ONE person reading that's intelligent enough to "get it". Ironic, isn't it? I especially love the egregious hypocrisy of Jeff Kirvin. He comes to PIC and spews the type of insults that he would immediately sanctimoniously BAN people for saying on the sites that he moderates. Go figure. Unfortunately, some people are just too clueless to figure that out. Well said, E.T. But to digitize your thoughts (rather than simply posting the words representing the thoughts) is to remove all ambiguity. Like "Pat" from Saturday Night Live, sometimes ambiguity can be A Good Thing. Do you Senseher(his?)shape? where's that NZ90 vs. LifeDrive comparison, btw? I only reviewed the VZ90. I would never buy that steaming pile of feces called the LifeDrive, so I could never offer any honest comparisons beyond what I've read and my brief exposures at Palm around the time it was launched/defecated. Only a fool would think I try to "perfume" my posts. And you need to stop taking posts to an Internet PDA fanboy/***irl site so seriously. I would ask Ryan to hold everyone to exactly the same standard no matter who they are or what they do for a living/hobby. Noble request. Will you volunteer to read (and moderate) EVERY post here? And then turn off readers with your heavy-handed approach? Just because TVOR is an anonymous poster with a bit of wit and some thoughtful insight shouldn't give him any more leeway when it comes to "moderation" (censorship) than the Palmsource employee or a PIC moderator. How about simply being even-handed? Indeed. Why should PalmSource employees like Marty Fouts and David Schlesinger be allowed to come here and post insults, trolls, misinformation and (the occasional) witty comment? Perhaps because censoring them would have deprived readers from some of the most entertaining threads ever seen on Palminfocenter? Go figure. "Cesspool"? Please. Leave the hyperbole to my pal, Dianne Hackborne. hkklife, you appear to be quite one-sided in your quickness to judge here. Please show me some evidence that I am wrong, and I will readily admit as much. Please show me where instead of defending TVOR, you have asked Ryan to censor "him". You really need to get a clue, Bubba. Sorry for that typo above-I meant VZ90 (the FINAL Clie) instead of NZ90. Did that review ever get posted here? If so I COMPLETELY missed it. Can you redirect me to an archived post of it? And I didn't mean for there to be a head-to-head review--just hoping that the LD could be make to look like even more of a folly than it already has become when compared to other, more capable "traditional" handhelds (TX, T3 etc). it powered down whilst connected via BT. I immediately tried to power it back on several times (to no avail). I then waited a few seconds, hit the power button again and it reset. The BT stack on the TX *IS NOT* as robust as on the T5 (patched or otherwise) and earier Palms!! It, like the LD, will NOT make a DUN connection via BT to my V710 Moto. Haven't had time to test it on an E815 yet. Since I am still mired in the remnants of a 2 year VZW contract I am going to have to either bite the bullet and get a new cell phone that works with the TX via BT, make do w/o BT DUN (not likely) or go back to my T5. This is, as usual, the fault of both Palm (lazy) and Verizon (greedy). Moto had NOTHING to do with the crippled BT implementation on the V710 nor with the utter lack of CDMA BT phone drivers in FrankenGarnet. I don't expect Palm to be of any help from henceforth due to their great desire to sell Treos (specifically WinMob-powered Treos). T|T, T2, T3, Z72, T5: All worked fine on V710 and other CDMA phones for BT DUN. None could dial contact #s without hacking the V710's firmware. Ok TVOR. I read your reply. I considered your points. But I couldn't come up with any valid reason to change my mind about anything I had written above. Whatever. Can you believe it? Palm ALMOST got a handheld release right. And all it would take is a simple CDMA BT driver to rectify this issue. I am certain they'll do nothing and lose more customers over this "issue". Hey, here's an idea - relax. We're talking about Palms, not religion, life, or your mother. There's no reason for anybody to get so offended and upset. There is also equally little reason to spend the majority of your internet time talking about how this new Palm offering isn't good enough. I'd like to think this PDA is actually pretty good. Sure, Palm is about two years late to offering dual wireless to the market. That's not the point. The point is, they've got one out now, and it has undercut the competition in price for its offering. It's the first genuinely solid PDA I've seen from Palm (PalmOne/Palm|SG) since the T3, and before that, the m500. Just think... hardly three years ago, three hundred bucks bought you an m130 and a 16MB SD card. Now we're looking at dual wireless, solid processor and memory, expansion, an arguably stable OS, and a great screen. Ryan: Update for the TX review??? Also, is it true that like the T5 it only has around 3 MB of heap space? I'd be surprised if Palm limited it like that. On the second question, as far as I know it's like the T5 in that it has something like 12-16 MB of RAM that's broken up into areas for app caching, heap, OS use, and so forth. Just bought one for my wife, and it did not have WiFi. It wasn't at the bottom of the screen next to to the bluetooth, it wasn't in the preferences, and there was no listing of .pdb or .prc files under "info". Looks like I wasted my time again debugging, and troubleshooting for Palm. This bum unit goes back, and I'm hoping to get a refund! Are you sure you didn't buy a T5, which, accept for the color, looks exactly the same? If it says "Palm" it's a TX. If it's the PalmOne branding, it's a T5.